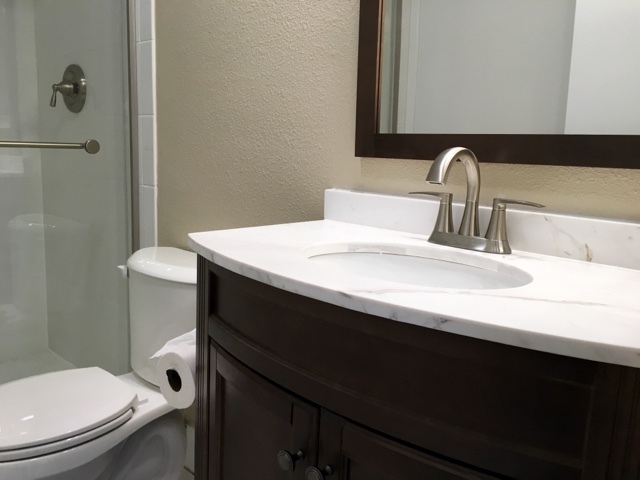 After a water emergency, a bathroom in a rental had to be completed gutted and remodeled. We kept the floor because it was not damaged and worked well with the new bathroom. In any remodeling project, labor cost will usually make up most of the budget, unless one is using exotic material. Since it is a rental, we not only need to please our renter but also keep a reasonable budget so no exotic materials. Instead of running around, we turned to big box improvement stores to procure our materials to make life easier. 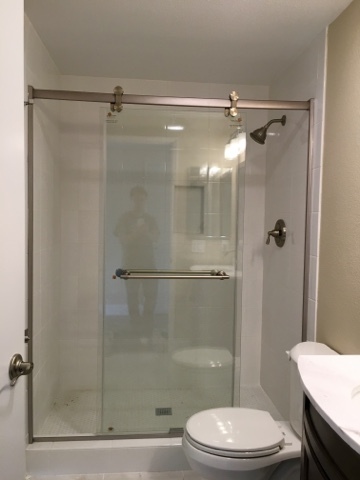 We had our contractors replace shower door with a barn style door. It was not more expansive but I thought it was rather cool looking. To keep with simple stylish look, large white tiles are used on the wall and honeycomb tiles on the floor. At the end of the day, in addition to all the new fixtures, all drywall damages were replaced, entire bathroom repainted and the bathroom door replaced. Total budget came in just slightly over $4000. Remodeling can be creative and exhausting at the same time. 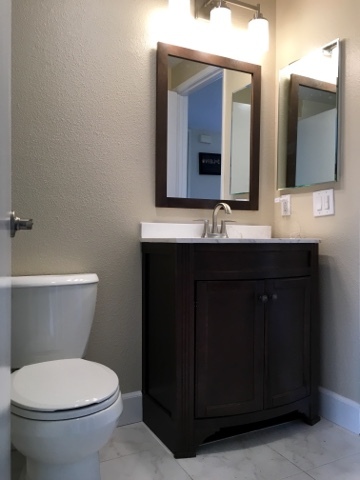 It was fun and savvy for us to find the vanity for under $300 with matching mirror. It took one week to finish the bathroom from start to finish. Now I can sleep easy!!! My next project is to set up playroom for Savvy Babe. This I am looking forward to start!